This distinguished room is named after original the land owner on which the estate would later be built. E. B. Nichols was a well-known banker and merchant to the Galveston and Houston area in the mid 1800's. The Merchant Suite has large original windows that open up from the floor allowing guests to walk through and onto the veranda. The room has a queen size canopy bed of carved mahogany, original to the home and tucked beautifully in the corner turret of the house. There is a private walk-in toilet/sink bathroom. 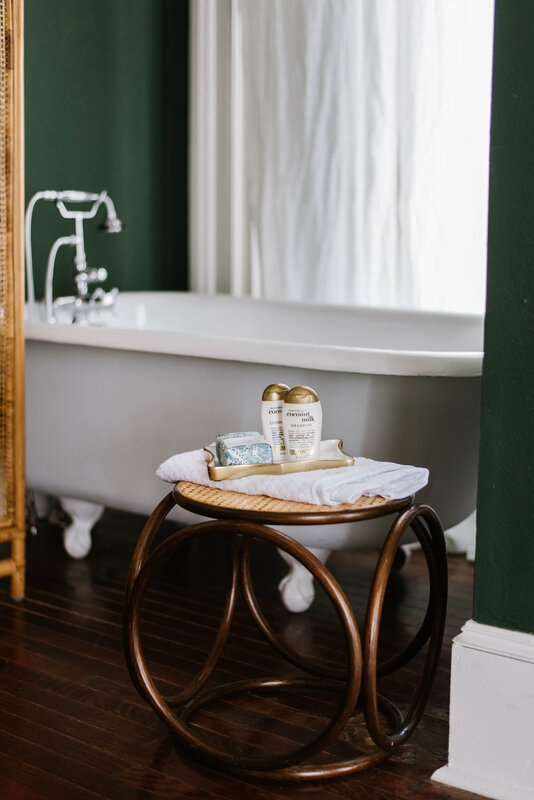 The original clawfoot tub set within a special wall nook, has a hand shower and a rattan screen for privacy within the room. The crown molding and fireplace are original to the expansion from 1889, and the seating area is a perfect, comfortable space to lounge and take in the eclectic room.